What does a globally acclaimed cosmetic company and Chicago’s own WNBA team have in common? They each have an unbelievable passion to use their respective areas of influence to make the world a better place!! My coaches and teammates joined me at Amazing Cosmetics’ studio in Libertyville for a wonderful day of food and fun where all the proceeds went back to Nothingbutnets. Basketball and beauty combined to offer Amazing mini-makeovers, chair massages, games for kids of all ages, shooting clinics and much more . . . proving once again that saving lives is not only a worthy cause in itself, but people can also have a lot of fun in the process!! Malaria is still one of the leading killers of children in Africa, but Nothingbutnets is working hard to change that statistic. A simple $10 donation will send a net and save a life!! It’s not to late to help out, by purchasing a $15 ticket for our upcoming game on August 17th, $5 of your ticket price will go directly back to Nothingbutnets!! (please add link or information for the ticket package here) So come out this Friday night as we make a push for the play-offs and you will not only experience world class basketball but you will make a global difference doing it!! Most people have mental pictures of starving children in Africa when the issue of poverty and hunger are raised—you might be surprised to learn that there are actually more than 16 million American children who do not have reliable access to the nutritious food they need to lead healthy, active lives. 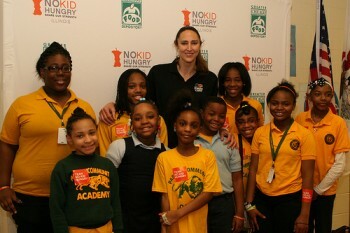 Recently I had the opportunity to represent the NBA/WNBA in Chicago at the Illinois No Kid Hungry Campaign launch. There are two reasons why I am compelled to write about this issue. First of all, I want our WNBA/NBA fans to know about this program and how they can either benefit from it or support it. Secondly, I want families, especially the kids, to know that some of their favorite NBA/WNBA players know exactly how they feel. We understand that it is not always easy to admit that you need help, and that as kids any time you are different whether it is your appearance or social-economic status, you are subject to being to being made fun of. We want to encourage our youth to understand that nutrition is just as important to them as it is to us as professional athletes. Getting enough healthy meals is essential for kids to be successful in school and in life. As you have noticed over the years, I try to be authentic and transparent about my life’s journey, because sometimes people just need to know that they are not alone in their struggles. This is an issue that hits close to home for me, because my family benefited from free and reduced lunch programs when I was growing up. I shared with the students that my mom did everything she could to raise my brother, sister and I, often working two jobs while raising us on her own, but sometimes there just was not enough money to go around. The free and reduced lunch program at my elementary school made sure that my siblings and I had a nutritious meal that my mom could not always afford herself. There was a common theme to the messages of all the speakers, and that was that there is not a shortage of food in America or a shortage of programs, but rather there is a shortage of access. The focus is to increase participation in all federal child nutrition programs, to connect eligible children and families to all available assistance programs (only 39.3% of the students who receive free or reduced lunches are taking advantage of the free or reduced breakfast programs and only 14% participated in summer programs in Illinois), and to invest in innovative programming that strengthens communities’ infrastructure and systems to get healthy food to children and their families. We want our kids to be strong, we want our kids to be smart, and we want our kids to be successful, so please find out how you can help end childhood hunger in your community!! For most people, the NBA All-Star weekend is a time where their favorite athletes showcase their talents in the various skills competitions or the game itself. All-Star is a weekend to me is a little of everything, business and pleasure, catching up with old friends and making new ones, watching the various games and participating in events myself. Here is my brief synopsis of this year All-Star weekend, according to me! Thursday: My weekend started out in typical “Ruth” fashion, as I somehow managed to lock my keys in my car before heading off on my drive from Miami to Orlando. Upon arriving, the day was filled with various interviews and photo shoots as well as a reception that night. It was exciting for Swin and I to have a visible reminder of the fact that we will once again be playing together as we posed for some photos in our new Chicago Sky uniforms!! It proved to be a great day of catching up with some of the players and staff from around the league. Friday: One event I always look forward to at All-Star weekend is the Technology Summit. There are always interesting and entertaining panels that discuss the latest advances in technology and how they pertain to our sports world. I am a huge fan of the NBA’s TNT crew, so I was especially excited to see that Ernie Johnson was leading the panel with Barkley, the entertainer Common, and various executives from Coke, ESPN, IMG and Tencent. It was a fascinating discussion on social media, where it is now, the role of it in the future and whether Barkley will ever jump on board and start a twitter account!! From there it was off to NBA Cares Day of Service, where Swin and I were joined by NBA Legends, Clyde Drexler and Dominique Wilkins as we were given the task to prep and paint one of the children’s rooms at the homeless shelter. It was very entertaining listening to those two guys share stories from “back in the day” as we were working!! From there it was off to Jam Session where I met up with my friends from the UN Foundation and the Nothingbutnets and Girl Up campaigns. 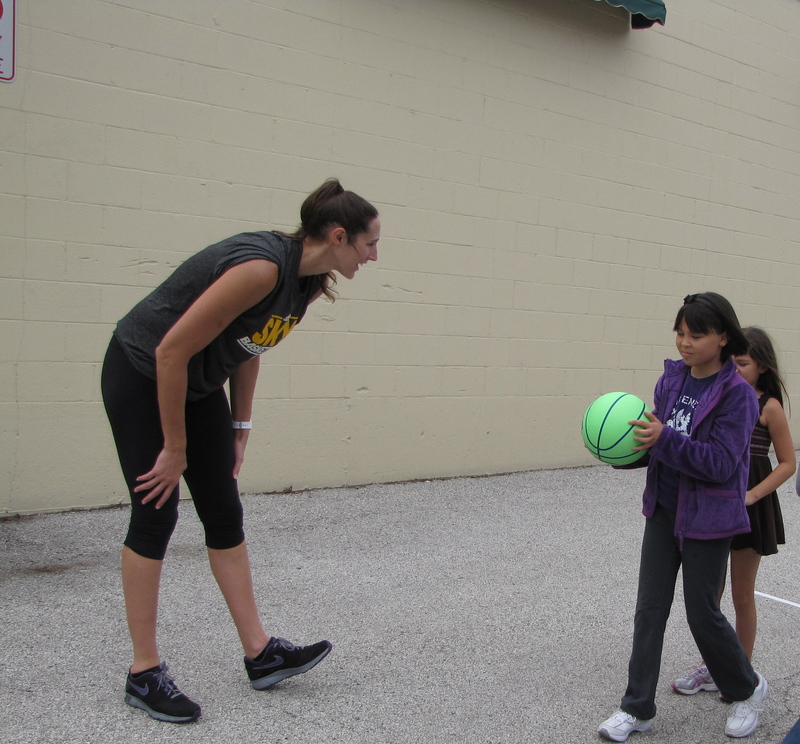 We had a great time doing a clinic with the kids as well as giving them a brief idea of some of these global social issues. I topped off the day by signing autographs with Indiana Fever’s Briann January and the Orlando Magic’s Ryan Anderson. Saturday: Saturday morning came a bit too early, as we met in the lobby at 8:00 to head to the Newsmaker Breakfast, where one of the world’s leading theoretical physicists, Brian Greene, was our keynote speaker. I will have to give him credit for being a very engaging communicator, but at the end of the day it does not matter how energetic you are, when you are using words like “inflating cosmology” and “multiverses” you are definitely going to lose me! The rest of the day was filled with receptions, and a few suite visits during the various All-Star events. Of course we were there to cheer on our fellow WNBA girls taking part in the Shooting Stars Competition . . . congrats to Cappie and her team for winning it all this year! Sunday: The highlight of my weekend was definitely the opportunity to meet and play with the Special Olympic athletes who were taking part in the Unity Sports Game. Saturday night I had the chance to meet and interact with all the athletes at a reception, so we felt like old friends as we took the center stage at Jam Session on Sunday afternoon. The teams consisted of both men and women from all around the United States. 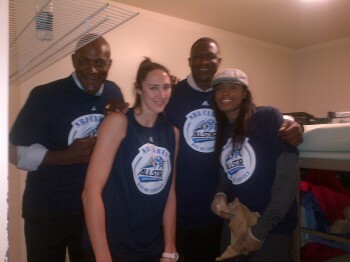 I was on the East team along with Lindsey Harding, Dikembe Mutombo, Sam Perkins and our fellow Special Olympians. The West was the rest of the Special Olympic athletes accompanied by Sophia Young, Marie Ferdinand-Harris, Chris Mullins and Clyde Drexler. I was so impressed by the talent level of these athletes! The highlights of the game were: Dikembe blocking one of the athlete’s shots and giving his signature finger waving as he told him to “get that outta here” only have the same athlete come down the lane the sequential possession and score over him with an amazing floater!! The game finished in dramatic fashion as the West had the ball with 8 seconds to go in a tied game. They called a timeout to draw up a play and I am going to chuck it up to Chris Mullins always being used to being on the floor in crunch time, as to why he was on the floor at the end of the game which game the West 6 players vs. our 5! After the officials got that sorted out and kicked Chris back to the bench (for the first time in his career J), the East came up with a huge defensive play and the game fittingly ended in a tie! Following the game we headed over to the NBA Fit court to do a clinic for some of the local Special Olympic Athletes with the help of our new teammates! The event was a wonderful reminder that it does not matter what your race, age, gender or skill levels are, sports are a perfect avenue to encourage unity and bring people together!! The night ended with the actual All-Star game itself, where most of the players are pretty loose and having fun until the 4th quarter rolls around and the game gets a little more serious. As I was leaving the game, I ran into Common, who I had not seen since we participated in the Celebrity Game together at a previous All-Star. Unfortunately for him, his boys remembered that I blocked his shot at the buzzer to secure a win for my team, so they had a lot fun reminding him of that!! Overall I had a wonderful weekend watching some of the best athletes in the world perform, participating in various community service events as well and making new friends along the way! Playing the last two years during my WNBA off-season in Athens, Greece where life is a party could not be more opposite to my current experience in AnShan, China, where their mantra is more like “all work and no play.” I have always embraced new experiences, and have been pleasantly surprised by my time here and what I have learned from the Chinese people. At first glance, the opposites are blatantly obvious, from my sheer physical stature to my democratic thought process. In all fairness, I have to admit that I am uncertain whether my experiences with Chinese culture is applicable to the masses or just the small percentage of which after having their talent recognized, were forced to drop out of school at a young age and practice twice a day every day of their lives up until the point where I now know them as my teammates. Our days are like those in the movie, “Groundhog’s Day” where Bill Murray wakes up and experiences the same day over and over again. To an outsider who is so used to having passion associated with sports, one would naturally question their stoical behavior on the court, until you realized that it is a natural defense mechanism where freedom is absent and perfection is required. As I walk though the streets of AnShan and some of the other smaller cities we play in, I am well aware that I am the only American some of these people will ever interact with in their lifetimes. Initially, people stare with what seems to be a very hard, expressionless face, but then a simple hello (nihao) and a smile will melt away the misconstrued harshness and very genuine greeting is returned. Once this preliminary barrier is broken I have found most Chinese people to be unbelievably kind and hospitable. When it comes to the Western world, the Chinese culture possesses a very dichotic reverence. On one hand you find there is high level of fascination and attraction and quite equally on the other you are greeted with the same level of mistrust and abhorrence. Overall you will notice there is very little pretense in their culture from their mode of communication, to the content of information, to their social interactions. Americans have championed the ability of talking a lot while really saying nothing at all, meanwhile, the Chinese words will be few, but they are spoken with an immense amount of intent and meaning. What is deemed “socially acceptable” in conversation varies greatly as well, as it is not uncommon for one’s personal information like their salary to be spoken with the same ease that Americans discuss the weather. With regard to relationships, most of the Western world has a wide social web of friends where interactions range from very intimate to extremely fake. The Chinese culture places more emphasis on depth and authenticity, so you will find that most people will have a tight circle of very close friends and they do not waste any effort trying to maintain pseudo relationships. More than any country in Europe that I have played in, China has remarkably preserved their history and tradition over the years and there is an unmistakable air of pride in their heritage. This is physically evident in the ancient temples, it is obvious in the knowledge of their countries historical events and figures and it is also evident in their unwavering adherence to traditions. Some might argue that this preservation has come at the steep price of communism and lack of modernization. Just as heartbreak increases ones ability to understand their capacity to love, witnessing the effects of socialism has allowed me to more fully comprehend the freedoms we enjoy through democracy. Please know that I am presenting my reflections with immense respect to the people who have so graciously welcomed me to their country, it is not my intent to come off presumptuous or egocentric. Surrounded by such devotion to their customs, I cannot help but contemplate how our country compares in this category. With the words of our founding documents constantly under scrutiny and the key values of our country seemingly negotiable, I find myself questioning how much if any of our heritage as a nation do we adhere to? It seems as if we are defined by the simple ideals of democracy, the freedom of thought and action and speech, but those principles by pure definition are constantly evolving with time. There is and will always be an overwhelming sense of patriotism and respect for those who fight to defend our freedom, but I cannot help but wonder if we have anything in our heritage that is concrete and static or are we and should we be defined simply by our freedom and ability to progressively evolve that??? There are two things just about every house in The Heartland (Indiana) has hanging up: a basketball hoop and a flag. 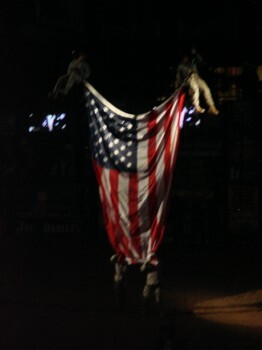 Raised as a good old country girl, patriotism was woven into my psyche as a child. A year and a half my elder, my sister, Rachel, was my rival and my best friend growing up. Upon our graduations from Notre Dame, I proceeded to enter the WNBA as she found her passion in life in the Army. She fell in love with the camaraderie, purpose and challenge she found there, first becoming an Arabic linguist and then proceeding on to become a Blackhawk pilot. As I was preparing for the 2006 WNBA Finals, my sister was also preparing for battle — only the real one. For those who have had loved ones bravely lose their lives to protect our freedom, my heart goes out to you. Thankfully, my sister was not one of them. Physically she returned a few months later to be medically discharged with severe depression and PTSD (post traumatic stress disorder), but my best friend, the sister, the daughter, the wife, and the mother are in essence still missing in action. Since then, I have watched my sister battle an opponent far greater than one that I will ever face on the court — it is the one she faces every day in her mind. There is a certain stigma when dealing with mental issues, as if it is a sign of weakness that should be only discussed in secret, if at all. When I was asked to write something for our upcoming Military Appreciation Night on Sept. 10th, I thought it was important for the 1 in 8 soldiers returning from service with PTSD and their families to know that we are so grateful for their sacrifices and service to our country!! If ever there was a time when saying “thank you” just does not seem to be enough to show the level of gratitude that is trying to be conveyed, it is when it is directed toward our appreciation for the brave men and women who serve in our armed forces. San Antonio has a very large military presence, with 4 different bases in the area, so we are accustomed to seeing men and women in uniform at our games, throughout the city and in the airport. As we honor our military, I want to make sure that they understand that it is a continuous flow of appreciation, and that our gratitude extends to every branch of the military as well as their families. We recognize that their sacrifices are not an isolated instance or singularly experienced. There are spouses who are left to manage households on their own, children who have never met their fathers, and extended family members who spend countless hours worrying for loved ones. On behalf of the Silver Stars organization, we proudly salute you and are eternally grateful for your service!!! I recognize that the majority of my blogs are serious topics, so in order to switch it up I am doing a light-hearted piece on what most of your favorite WNBA players are experiencing overseas right now. Before I continue, please allow me to say that in no way am I trying to insult anyone from Europe. I have absolutely loved every team and country that I have had the opportunity to play in and I think that Americans could learn a lot from each of these countries. YOU KNOW YOU ARE IN EUROPE WHEN . . . . .
– your plane never actually pulls up to a gate, but instead you wait for everyone to disembark and get on a passenger bus only to take you the 10 feet that separates your plane from the actual airport. – taking an on-side step to start a drive or doing a spin move at the end of a play is traveling, but the five steps you take at the end of the drive are not? – when someone says they will do it “tomorrow” that really doesn’t mean the following day . . .it refers to some approximate date in the future. All jokes aside, I love being back in Athens with my teammates and coaches at Athinaikos as we try to defend our Greek and EuroCup titles!!! Upon finishing the last page of the book, Invictus, I found myself flushed with emotions of joy, sorrow, hope and inquisition. The setting of this book is one that I am especially fond of, because for the last three years, South Africa has been home to me during the month of December. As my relationships deepen and my knowledge of their culture and history increase, I cannot help but be appalled at times of my own ignorance to the struggles South Africa has gone through and the injustices that occurred during apartheid. I find myself amazed that in a modern world these atrocities still occur … and I cannot help but question: why? Does history really have to repeat itself? Even though it has in the past, can we finally learn the lessons of those before us without having to experience them first hand? Is it because we do not share our knowledge with one another or seek understanding beyond that which impacts our everyday life that we must learn those lessons again ourselves? Or are these tendencies of prejudice, pride and discrimination unfortunately ingrained in humanity? I have come to the conclusion that it is probably a little of both. Like most parents, my mother tried to give me guidance growing up to protect me from making the same mistakes she did . . . but there were also times where the life lesson could only be learned through experiencing the pain myself. We try to teach our children right from wrong, but quite possibly these lessons cannot always be taught sometimes they must be learned on their own. Invictus is such a powerful book, because it highlights the incredible leadership of Nelson Mandela and his ability as a leader to continually offer a hand of reconciliation where most of us would have been quick to offer retaliation. If history must repeat itself, then let it also repeat the example that Mandela offers us all . . . one of vision, constantly seeking peace over revenge and humbly being the first to bridge the gap that prejudice so skillfully divided. As I have mentioned before, sports provides an amazing platform that transcends the differences that exist in our everyday world concerning race, gender, religion and politics. Invictus also does a wonderful job of illustrating that it is not solely the athletes that are responsible for utilizing this powerful element of sports, the fans play a vital role as well. As a player, I can tell you that I appreciate the passion that our fans exhibit—in the case of the 1995 Rugby World Cup, this passion was masterfully used to help heal and unite a nation. Granted we are not overcoming an era immediately following apartheid here in the United States, but we are far from perfect in how we respect and understand one another. Whether you are cheering for me or against me, please allow your passion to help you see that you have more in common with the person next to you this summer! Breast Cancer, what comes to mind when you hear those two words? Fear, chemo, death? Perhaps it is perseverance, to conquer, or a survivor? Whether it is the memory of a loved one you have lost, the face of a friend who is fighting it now, or the scars you posses as a daily reminder of your personal battle, almost everyone’s life has been effected by this disease. You may have noticed a common theme throughout my blogs is creating awareness and evoking action accordingly. Throughout the season, you have seen us wear pink uniforms in support of Breast Health Awareness, one of our WNBA Cares initiatives. I find that people are often touched or moved by different causes, but are uncertain how they can help. I hope this story provide you with not only inspiration, but also confidence that you too can make a significant contribution. Upon landing in Wichita, Kansas, I set out for my 2 ½ hour drive with nothing but endless, flat farmland as far as the eye could see. For those of you who grew up in a city, it may be hard for you to imagine towns without stop lights, sharing the highway with tractors, or waving at every vehicle that goes by (because if you lived there, you most definitely knew everyone you passed on the road) but this is simply a way of life for those residents in Wilmore, Englewood, Protection, Ashland and Coldwater (WEPAC Alliance). In these five tiny western Kansas towns, you will be hard-pressed to find somewhere that serves your venti no whip extra hot caramel macchiato or a gourmet restaurant beyond the local diner or truck stop, but what you are guaranteed to find is something many of us have lost touch with in the chaos of our busy lives: a sense of community. Joe Labelle, a 21-year old resident of Ashland, just lost his grandmother to breast cancer, and wanted to do something about it. He had no idea that his idea of doing a local Pink and White All-Star Basketball Game would unite these five small communities through one of the most memorable sporting events western Kansas has seen. Over the next eight months, a committee was formed, calls were made, sponsors were found, and numerous volunteers turned Joe’s idea to a reality, as Hoops for Hope was set for Oct. 30, 2009. Upon finding out that only six local girls could play at a time, the challenge came to fill out the rest of the rosters. Jackie Stiles, born in Claflin, KS, was contacted and gradually, one by one, former players from KU, K-State (Shalee Lehning) and other bordering state schools agreed to come and play. After committing to coach the game (I was born in Ransom, KS), I quickly found that my coaching debut would be against one of the greatest players to ever grace the hardwood, Cynthia Cooper. Losing her mom to breast cancer in 1999, Cynthia not only decided to come and coach the game, but she also agreed to be the keynote speaker in the Health Forum the following day. When organizing the game with Benjamin Anderson, CEO of the local Ashland Health Center, the event quickly became more than just your average all-star game. Its focus was to provide resources, and educate and encourage local women to take active responsibility for their health. It has been found, that when we invest in the health, well-being, and education of the women in our communities, our culture changes because women in the United States make 80% of the health care decisions for their families. When we teach them the importance of good health and preventative testing, they pass that knowledge on to their loved ones, but when they neglect their own health, the whole family and community suffers. For these women, the 2 ½ hour drive I made was not one that took them to the nearest airport, but rather to the nearest hospital were they could get a mammogram. When money is tight and there is a family to be taken care of, many women in these communities opted to not make this necessary trek. The key to fighting breast cancer, which affects 1 in 8 women, is early detection. The health forum following the game stressed to these women the importance of being proactive when it comes to their healthcare. The proceeds from this game have made it possible to bring a digital mammogram machine to Ashland once a month and because of the publicity surrounding the game, equipment was donated, providing the opportunity for cancer patients to receive chemotherapy locally as well. One young man’s idea and numerous volunteers and supporters have forever changed the landscape of the health care in these five small Kansas towns. If you take nothing else away from reading this, let it remind you that anything is possible. Take what you are passionate about, use your area of influence, surround yourself with other like-minded people, and set out on your own journey to make a difference. Whether it is to honor someone we love, support a cause we believe in, or change an aspect of society that we aspire to be better, our motivation may vary, but the potential for our impact is as endless as the flat, farmland that I passed on my 2 ½ hour drive back to the airport in Wichita. This year, World Malaria Day proved to reinforce for me that Malaria is not just a problem in Africa and NBN is not just a campaign limited to the United States. It is a global issue and therefore a universal approach can and must be taken in order to provide a solution. Over the last two and a half years as a spokesperson for Nothingbutnets, I have traveled to Africa, saw first hand the devastating effects of malaria, came back to the US, shared passionately with you all what I saw, then went back to Africa as we delivered the nets you so generously provided. This year, my role as a spokesperson took a little detour as I found myself finishing up my basketball season overseas when April 25th rolled around. (“a game against malaria”) where USA, Notre Dame, and San Antonio have been positioned across my chest before. . . I was reminded that this was not my normal basketball game. No, there was no preparation or scouting beforehand. In all actuality, our opponent (a tiny organism called plasmodium, that causes malaria) would not be wearing a uniform or even participating in the game. Este año, el Día Mundial contra la Malaria no vino más que a reforzar mi idea de que la malaria no es solo un problema en África y Nothingbutnets (Nada pero Redes) no es solo una campaña limitada a los Estados Unidos. Es un problema global y por lo tanto un enfoque universal que puede y debe ser tratado a fin de darle una solución. Durante los dos últimos años y medio como embajadora de Nothingbutnets, he viajado a Africa observando de primera mano los devastadores efectos de la malaria, volví a los Estados Unidos, compartí con todos vosotros lo que había visto, entonces regresé a África para repartir las redes que vosotros tan generosamente nos habíais proporcionado. Este año, mi rol como embajadora se desvío un poco de modo que terminé mi temporada de baloncesto en Europa el dia 25 de abril. Asi que tuve la oprtunidad de intentar concienciar a la gente en España, me asocié con Canal Plus para producir un partido de gente famosa. En mi carrera, he jugado muchos partidos y he tenido el honor de llevar puestas camisetas de numerosos equipos, pero cuando miro atrás y veo las simples palabras: Un partido contra la malaria donde USA, Notre Dame y San Antonio han estado puestas antes…Yo puedo ver que no es un partido normal. No hay ningún tipo de preparación o scouting antes. En la actualidad, nuestro oponente ( un diminuto organismo llamado, plasmodium, que causa la malaria) no llevaría puesto ningún uniforme ni participaría en el partido. La única cosa acerca del partido es que al final del día no habrá ningún ganador ni perdedor, porque todos nosotros estamos en el mismo equipo. Yo estoy muy agradecida a las personalidades de la T.V, políticos, deportistas olímpicos, compañeras de equipo, entrenadores y jugadores españoles legendarios por apoyar esta causa y participar en el partido. Estuve muy contenta por la respuesta de la gente de España, y su afán de unirse a la campaña Nothingbutnets y nuestra lucha contra la malaria. Este año el Día Mundial contra la Malaria me dió una nueva perspectiva.Aprendí que no importa en que parte del mundo vivamos, siendo conscientes invocamos el mismo deseo a la gente para ayudar. La solución es la misma a pesar de donde vivamos: Envía una red. Salva una vida. Alone in my apartment in Rivas, Spain, I sat unmoving, yet entirely moved, as I watched the historic inauguration of our 44th president of the United States of America. My spirit rejoiced with the millions of others, past and present, who believed that the virtuous words of equality that our nation was founded on would one day transpire into an undeniable reality. With a triad of emotions, I sat in reflection of the past, present and future. I was sincerely saddened by the existence of slavery and injustice that fills the pages of our nation’s history. I found myself unbelievably humbled and grateful to those who held steadfast to the vision of what our nation could be, whose life purpose was to be a part of the road of progress. Although slow in its development, and not always evident in their lifetime, the residual effects of their vision came to culmination this day. What an amazing reminder that what we stand for today, may not always be apparent in our own lives, but it will most definitely shape the direction of generations to come. Then, there was the hope and inspiration of what lies ahead, as we continue to battle some of the challenges of old as well as those that accompany a new time and a new age. President Obama spoke of a new era of responsibility, that we are the guardians of our liberty, and should embody the spirit of service both domestically and abroad. In these tough times we must be committed to working hard, being a part of the solution, and extending a helping hand. What is it that you would like to see changed in your life, in your community or quite possibly in the world we live in? What is your passion or area of influence? Does your neighborhood need a better community center? Children need mentors? Elderly need companionship? Let us all become active participants in the realm of change we wish to see take place. With a renewed sense of unity, let us continue down the road of progress, taking ownership in our actions now, as we define not only the legacy that we will leave behind but also the possibility of what is yet to come!